The differences, fragmentation, and heterogeneity celebrated by some postmodern theorists is replicated in the plurality of post-modern positions and warring factions between and within different camps. If we abstract from many of these differences, we see that postmodern theory is polarized around two conflicting wings. Baudrillard, Kroker, and others espouse an extreme post-modernism that repudiates modern theory and politics while heralding a postmodern rupture in history. Laclau, Mouffe, Jameson, Fraser and Nicholson and other feminists, by contrast, adopt postmodern positions while stressing continuities between the present age and modernity. 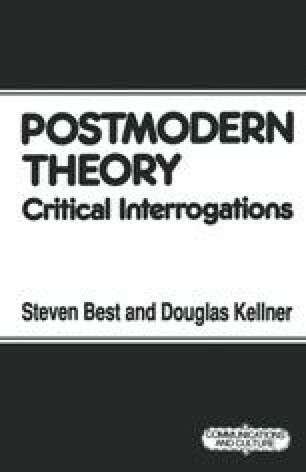 For these dialectical thinkers, the discourse of the postmodern is a borderline discourse between the modern and postmodern that allows a creative restructuring of modern theory and politics.